Action Mental Health’s eating disorder service within the Southern Health and Social Care Trust (SHSCT) area is being relaunched, introducing a new model of support for people experiencing eating disorder and their families/ carers in partnership with the SHSCT , which could act as a model for the rest of Northern Ireland. 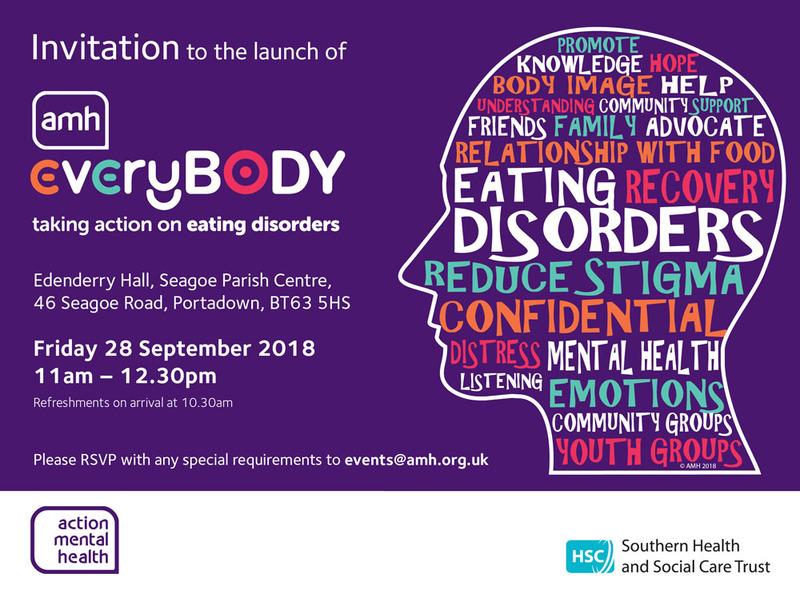 The launch of ‘AMH everyBODY’, formerly known as Adapt, will take place at Seagoe Parish Centre on Friday, September 28 where an overview of the service will be shared, illustrated by a service user, carer and representative from SHSCT. Statistics show that eating disorders claim more lives than any other mental illness, with one in five of the most seriously affected dying prematurely from the physical consequences or by suicide. AMH everyBODY will promote a greater understanding and awareness of eating disorders, promote positive lifestyle choices in people about eating to develop preventative, self-supporting skills and break the associated stigma including unhelpful assumptions that it is attention-seeking behaviour or fad dieting that stops people seeking the support they need,– having an eating disorder is a serious mental health condition. The focus of AMH everyBODY’s approach is recovery through partnership; a partnership between the person, their family and the SHSCT, who in working collectively will provide comprehensive support towards recovery. AMH everyBODY provides much needed support not only to the person affected but also to their families and friends at the Carers’ Group monthly meeting.. Eating disorders affect over 700,000 women and men in the UK at any one time, with research suggesting that this figure is vastly underestimated. It is thought some 80% of individuals who screen positively for having an eating disorder have never accessed help or support. One of the most harmful symptoms of an eating disorder is silence – AMH everyBODY encourages people affected to speak out for support and know that a listening, understanding and confidential ear will be there to provide support towards recovery. Action Mental Health’s Deborah McCready, everyBODY Project Worker said: “AMH everyBODY exists to bridge the gap on the clients’ journey from the moment they seek help until they eventually get to speak to a medical expert, as with existing waiting lists this can be a long time. “When people have taken that important step and are willing to engage and seek help, AMH everyBODY offers a recovery approach in sessions when people will receive information and support to develop skills, stay focused and healthy until they see a therapist.” Prior to appointments people can feel unsupported and alone, contact with AMH everyBODY at this time will help people support themselves and get the best from their therapist when they meet. AMH everyBODY Manager, Colin Loughran: “This is a very practical model and one that could be used as a model of best practice throughout Northern Ireland.“There is a significant shortfall in support services for people experiencing eating disorder and their families, prior to patients being seen by clinicians,” he said. “This new service will fill that gap, giving people access to specially trained staff who will provide the vital support to help people in their recovery”.